In response to stress, plants and animals can exhibit rapid changes in their biology, enabling them to maximise their fitness. Exposure to stress can also generate long-term 'memory', which enables the individual to become more resistant to future episodes of stress. Our current research focuses on this phenomenon, which is commonly known as 'priming'. Priming refers to the ability of plants to mount enhanced future defence responses following pest or pathogen attack, or exposure to particular environmental conditions or externally applied chemicals. During the last century, agricultural modernisation included the development of synthetic chemicals that can be used to kill pests and pathogens. These pesticides can be very effective, but have the disadvantage that they can damage the environment. This, along with associated retailer/consumer concerns about the possible human toxicity of some conventional pesticides, has led to increased pressure to find alternative approaches to pest and disease control. One approach that may contribute is the development of methods to enhance plants' own natural defence mechanisms. 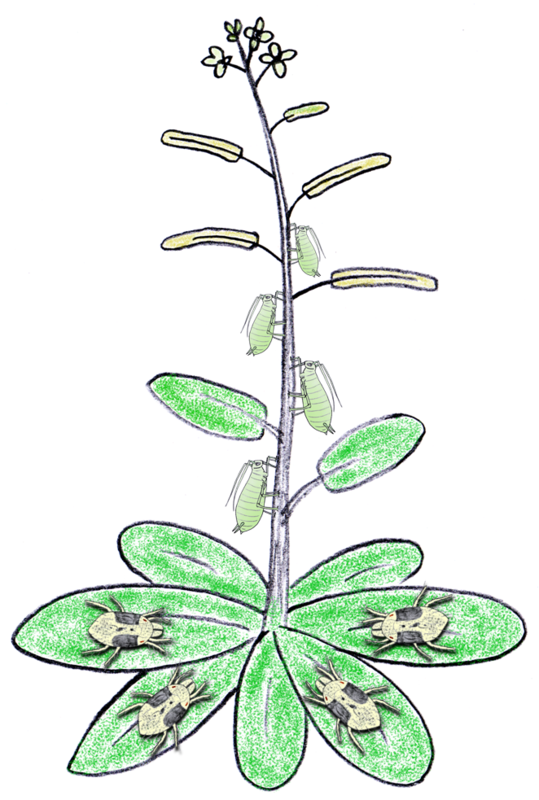 We have shown that seed treatments using elicitors of plant defence such as the plant defence hormone jasmonic acid (JA), are effective in priming defence responses in a range of crop species, generating increased resistance to various types of pest, including aphids, caterpillars, mites and fungal diseases. 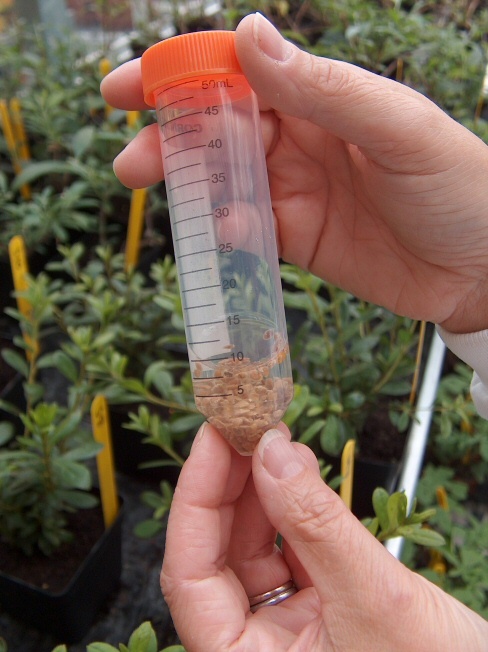 Although the idea of using elicitors such as JA to activate natural plant resistance by application to growing plants is not new, the discovery that treating seeds can provide long-lasting protection without adverse effects on growth and development is novel, and provides a simple strategy for deployment in agriculture and horticulture (see Impacts). We are currently focussing on uncovering the mechanisms underlying the seed treatment-induced priming effect. Over recent years, evidence has accumulated that exposure of an individual to stress can prime defence not only in that individual, but also in its offspring. Such effects are referred to as 'transgenerational', and are assumed to have evolved to maximise survival of an individual's gene pool when future generations are likely to encounter similar stresses. Through collaborative work between out lab in Lancaster and Jurriaan Ton's group at the University of Sheffield, we recently made the important discovery that progeny from plants suffering disease or herbivory are more resistant than genetically identical offspring from healthy plants. This increased resistance persists over at least two stress-free generations, suggesting epigenetic inheritance. Resistant progeny do not show increased defence activity in the absence of pests and pathogens, but instead exhibit augmented responses to infection. We therefore refer to this phenomenon as 'transgenerational immune priming' (TGIP), since progeny plants are primed to respond more rapidly to infection. Importantly, we have begun to uncover the mechanisms underpinning this immunological plant memory, and discovered that TGIP is based on DNA methylation, a reversible DNA modification that can have a profound impact on gene activity without changes in DNA sequence. Transgenerational immune responses have important implications for natural plant populations, and present an opportunity for exploitation in sustainable agriculture. The ability to improve resistance to pests and diseases through epigenetic manipulation provides a new mechanism by which reliance on chemicals can be reduced without having to change the genetic make-up of our elite crop varieties. This is an exciting new area of research which has already drawn the attention of the academic community (e.g. CMJ Pieterse (2012) Editorial. Plant Physiology 158: 545).